Time for more multi-lingualism! The Big League Stars set features French and English on each card, all the better to socialize your medicine with. (Sorry, that's "appeal to its Canadian audience.") This batch of 48 blank-backed cards represents World Wide Gum's (WWG) first post-war effort and profiles the International League, which included both American and Canadian teams. Montreal's Royals, Brooklyn's AAA farm club known for prepping Jackie Robinson a few years earlier, won the 1949 title and WWG probably capitalized on the interest by making these cards. The 1950 set breaks WWG tradition by presenting all-new content, not just recycling Goudey's look-and-feel. 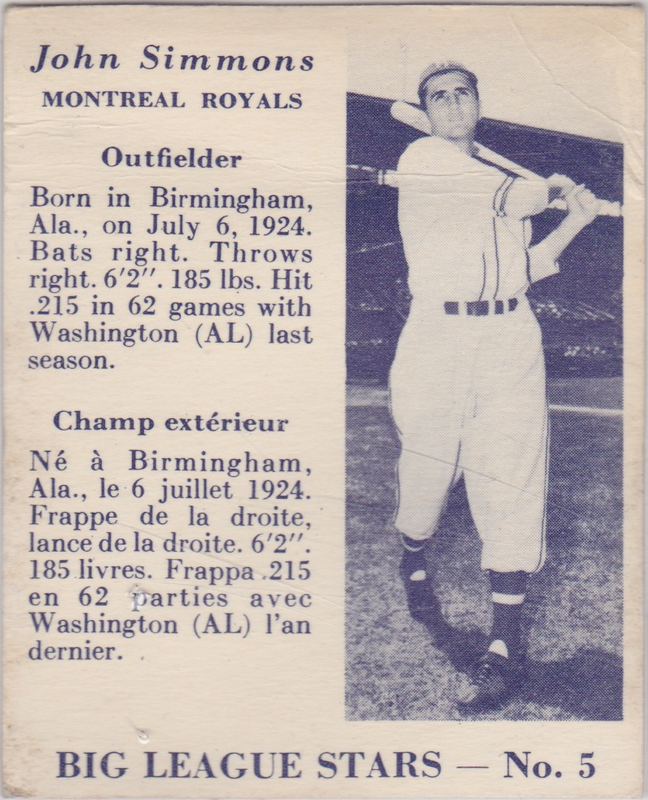 (Boston-based Goudey owned Montreal-based WWG and they worked together on earlier Canadian sets a la the more recent Topps and O-Pee-Chee relationship.) It seems a misnomer to call a minors-only set "Big League," but that's in the modern context of huge money sports. Montreal, at least, owned multiple recent titles and the prestige of being connected to a New York parent. (Unknowingly, they even fielded the strong bat and arm of The future Rifleman.) You couldn't call this set "Major League," but many of its players would end up in the the bigs sooner than later. 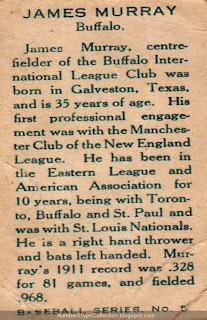 John Simmons didn't have much of an MLB career, just one year with Washinton in 1949. However, I can't ignore the statistical oddity of his batting line. 20 hits in 93 at bats, a .215 average. More specifically, he had 20 singles in 93 at bats for a matching .215 slugging percentage. 11 walks against only 6 Ks bumped his OBP a bit, but is it mean of me to suspect that a few of those walks were cursory and intentional, just to get to the pitcher? Sometimes I wonder at the arbitrariness of how we collect and value cards. OK, we like the Mick. His picture still looks good. A wrinkled patch of whiteness, though? That matters? A half-inch square of murky upper-left corner that you can still read through? What about all the French on the card? Would a true patriot want this in their collection? He's a Yankee, right? Ah, a conundrum. Politics aside, I've always enjoyed other languages on cards. Before Topps and O-Pee-Chee's overlap kicked off in the mid 60s, Post jumped in with this appealing cereal box set. It represented a big investment, as 1962's design spread across three different issues: domestic Post, Canadian Post, and Jello. Two cards, Mantle and Maris, even turned up in Life Magazine as advertising. All share the same design elements, though Canada got reduced player text in exchange for its second language. Post and Jello collectors often define their collection by the number of short prints obtained and remaining. Frustratingly, the SP numbers vary by set, so #55 Wynn is rare in the Posts and more commonly available in the Jellos. Collectors or dealers who don't understand the set history can easily buy or sell the "wrong" kind of rarity. At least the Canadian versions distinguish themselves with "RECORD DES FRAPPEURS." As for the others...bon chance, mes amis! Value: This low-grade gem cost me about $15 on eBay. Multiple classic features like creasing, tape stains, and missing paper knock down the "condition," but none of them make Mickey any less Mantle. Fakes / reprints: They're possible, but I haven't seen any fake Canadian cards in the marketplace. Sweet mercy, is that the mono-est monobrow that ever lived a life in California? 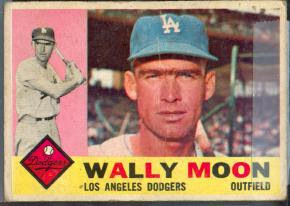 Witness the calling card of Wallace Wade Moon, 1954 ROY for the Cardinals and later a fine outfielder for the LA Dodgers. A smart and more-than-capable hitter, even as a rookie he prompted St. Louis to ship future HOFer Enos Slaughter off to the Yankees to make room in the outfield. 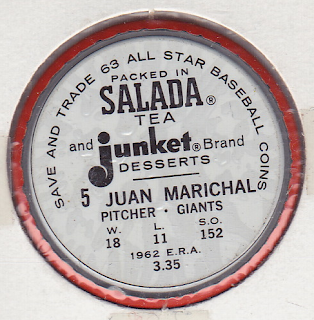 Some people really enjoy the 1960 Topps set's horizontal layout. It recalls the classic 1956 sideways design and again features dual pictures. Its colors, though--hmm. The alternating, blocky typeface weighs down the front like an anchor made of cast-iron mediocrity. I think enlarging the player photo and minimizing the text would really improve things. After all, the 50s card really showed off players by capitalizing on the larger stock size and integrated portrait + action shot. Everything flowed together. In this case, unfortunately, the black-and-white photo, color photo, and overdone label work against each other. The remainder of their 1960s sets went back to "vertical," so I assume sales didn't support this change in design. Classic elements like 1962's wood grain and 1965's pennants made for more memorable sets, though you'd see the occasional horizontal card again in 1973 and 1974. This issue does a nice job considering the small size provided by a dollar-sized coin. Its clean layout includes a full-color photo, some player text on the reverse, and a raised edge to protect the front from scratches and other shenanigans. Most oddball releases fall significantly below the bar in release quality or content, but the Salada / Junket amalgam turned out a nice product that rivals Topps own coins from the 60s and 70s. 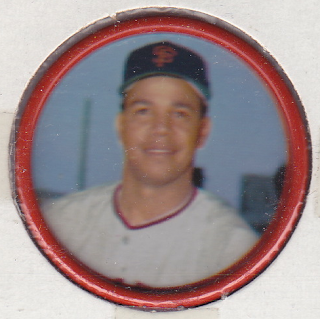 The 63 different coins in their 1963 "All-Star" set comprise most top players of the day, Hank Aaron to Maury Wills (who still hadn't appeared in a Topps set). Only one complaint, really--could we get more action shots? I know head shots take up less space, but it's always excellent to highlight players with such an individual style like Marichal's. It gets you that much closer to the game and shouldn't be overlooked, even today. Hey, it's another leaders card! 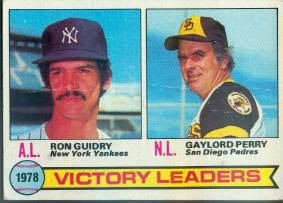 Topps limited it to each league's top banana, however, and this pair of guys couldn't be more different. Guidry looks all business as the young ace, 25-3 in 1978, who can't wait to mow down another 27 guys. Perry seems mightily amused that 1978 saw him become the first player to win a Cy Young in both leagues--and at age 39. (He went 21-6 with a 2.73 ERA for the 84-78 Padres.) It'd be entertaining to have the two face off in their prime, if only for the contrast in styles, dominance versus guile (or spit). That raises a question: is Perry famous for throwing spitballs, or famous for being reputed to throw them? He claims Bob Shaw (featured on yesterday's 1963 #5) taught him the pitch in the mid-60s. Plenty suspect he threw doctored pitches every game, leading opposing managers and umpires to regularly check his glove and uniform for shenanigans. Most of the funnyball stories (true or false) came via recollection and my favorite was told by former Mariner Julio Cruz following the final game at the Kingdome, where Gaylord was a guest. "I remember it well, that final out for 300. Willie Randolph grounded a ball to me at second. I fielded it and carefully picked it up from the dry side..."
The Baseball Page notes that Perry wore a different uniform every inning during his 300th win, an avant garde take on memorabilia re-selling new to the 80s but more familiar to today's collector. After my LL design critiques yesterday, I like this clean layout much better. Two leagues, two guys, and no floating heads. Of course, it's not perfect. Adding the actual number of victories to the front would've been an easy improvement. Mentioning they were both Cy Young winners would've been a bonus. 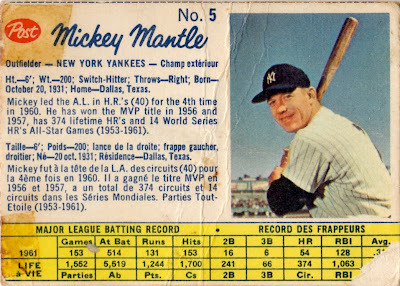 Numbering a set seemed an afterthought at the dawn of baseball's card era. Companies printed them as promotional materials, like banks make calendars and pizza places make magnets. 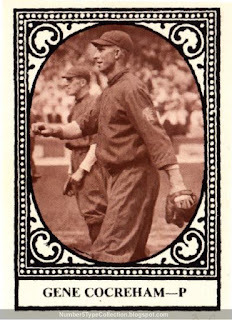 I don't know of any individually numbered cards from the 19th century and the "E" cards from 1909 and 1910 include a complete checklist on each card back rather than actual digits. Is it fitting that a non-American company would be the first to organize a set this way? This 90-card effort from Canada's Imperial Tobacco company presents players in the "minor" Eastern (aka International) League respectably with sepia-toned studio photos. Two HOFers prove its key cards, Joe Kelley and Iron Man McGinnity. 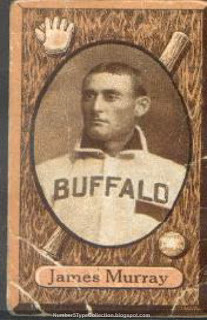 Buffalo's Jim Murray might not be an essential component, but he looks pretty good for being close to 100 years old. As best I can tell, Mr. Murray appeared in very few major league games. After a handful of hacks in 1902 with Chicago, he bounced around other leagues until 1911, resurfacing in St. Louis for about 100 at-bats. Both years yielded a sub-.200 batting average with little power, so it's somewhat surprising the Braves picked him up in 1914. At least he "rewarded" them with a .232 performance, pulling his lifetime average north of the Mendoza line. (.203!) 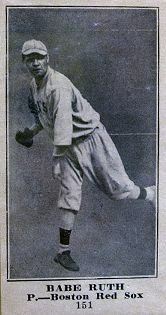 The St. Paul Saints purchased the 36 year-old in mid-1914 and he presumably wrapped up his career there or soon after. Speaking of St. Paul and minor leagues in general, I'm halfway through Wild and Outside by Stefan Fatsis, which highlights the mid-90s rebirth of the Saints. Most don't expect lower leagues to really compete with the AL and NL these days. If anything, they move players up the ladder to their "peak" (A, AA, AAA, or MLB) and gradually--or quickly--drop anyone stuck in denouement. As an independent team, the Saints prove a good counter-point to this view, paired geographically as they are with the Minnesota Twins. The situation probably parallels how the Eastern League sought to succeed in the shadow of the majors' lock on most northeastern cities back in 1912. More to say once I'm done with the book itself! Value: This obscure set doesn't get much attention, so remains affordable. A low-grade eBay auction closed at $15 in March 2010. Fakes / Reprints: Like most tobacco sets, this is vulnerable to reprinting. The relatively low value lessens the risk, but definitely find out something about a card's history if you plan to get one. This card kind of creeps me out, so it'll go by as quickly as possible. 1948 saw the release of The Babe Ruth Story, a little-regarded film about Ruth's life and gargantuan impact on the game. The Philadelphia Gum Company turned out a fairly small set to "celebrate" (i.e., cash in on) its release; each card tracks a character or event from the film. 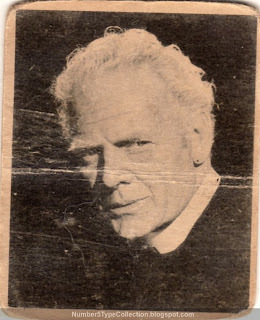 The crafty veteran pictured here is Charles Bickford, who portrays the young Ruth's strong-handed spiritual guide, Brother Matthias of the reformatory St. Mary's Industrial School for Boys. This education, at least from Matthias, included the game of baseball. From what we can tell, the Babe's early skills developed almost entirely during his time at St. Mary's. The speed of Ruth's introduction to the game bears little resemblance to what players go through today. 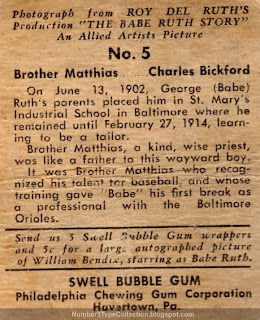 At 19, he signed with Baltimore early in the 1914 season and appears on one card as an Oriole. They dealt him to Boston on July 9th. Ruth pitched (and won) his first game on July 11th. With little room on the roster for raw talent, the Red Sox sent him to Providence for most of the season's second half. These days, who knows? As a good young pitcher, perhaps teams would've stashed his good arm in a southern league for "seasoning" as a #2 lefty starter and told him to ignore that batting nonsense.